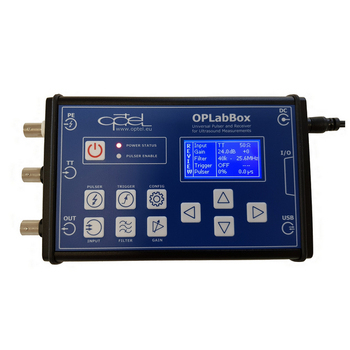 OPLabBox 2.0 is particularly well suited for ultrasonic measurements. Wide bandwidth amplifier with a switched bandpass filter and integrated pulser makes this device suitable for a variety of ultrasonic applications in the industry as well as in the laboratory. 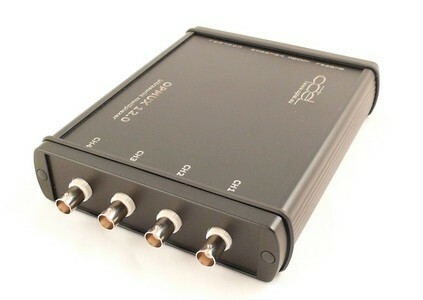 It is designed to work as a self-sufficient scope adapter, however, it can be used as an expansion box to other signal processing devices. Together with our ultrasonic testing devices (OPCARD or OPBOX) enables to implement a complete ultrasonic system with full hardware and software support. 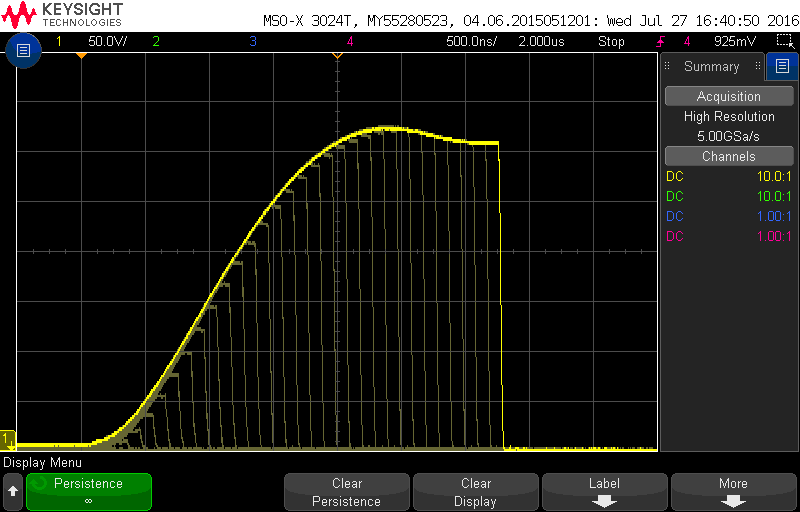 - Input amplifier gain: 104dB total gain range: -10 to 70dB step 0.1dB, +0 or +24dB switched post amplifier. 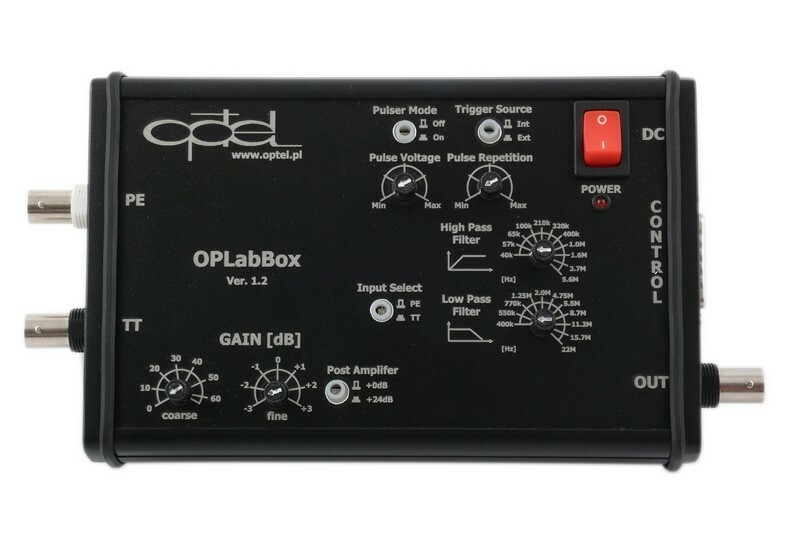 OPLabBox is a wide bandwidth (40kHz to 25MHz) low-noise amplifier with a switched bandpass filters and integrated step pulser. 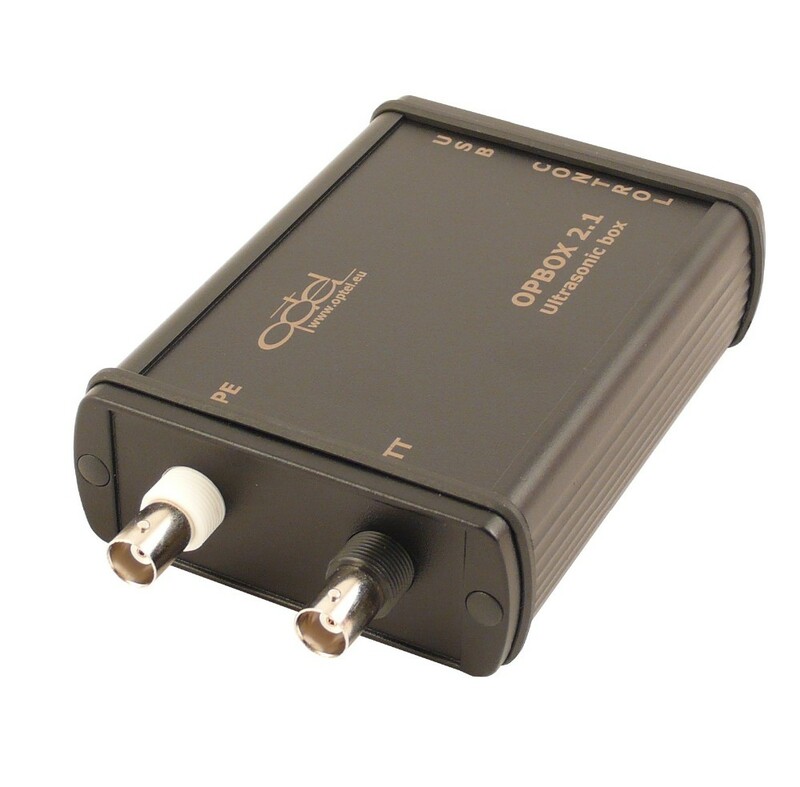 The device can be used in classic ultrasonic applications with one or two ultrasonic transducers as well as universal broadband signal amplifier. The new design has a graphical 2-inch LCD display and user-friendly interface. 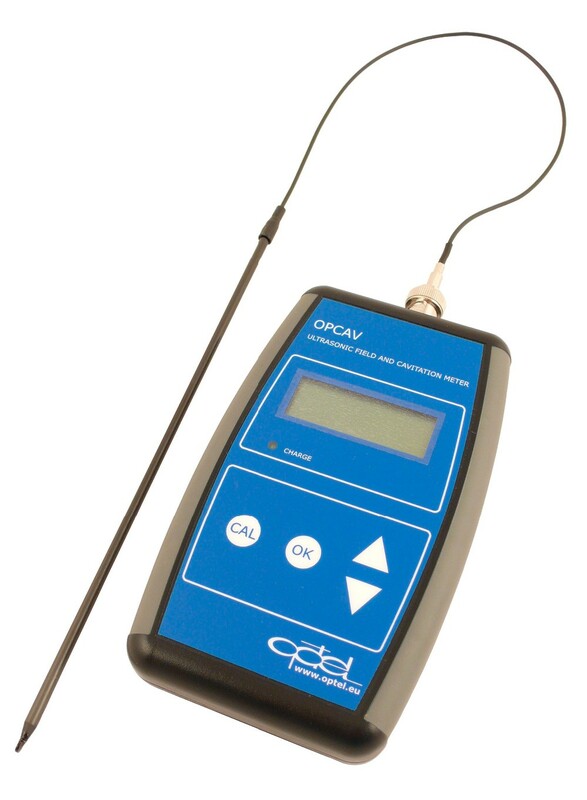 Remote control functionality allows being used in automatic measurements setups. Optel Sp. z o.o. (Ltd) is an innovative company established in 1989. It employs a team of engineers, that is passionately following their goal to create new, innovative products. We specialize in ultrasonic technologies and after decades of gaining experience, we have become renown specialists in this area. In past years, we have been solving with good results technical problems of our customers. 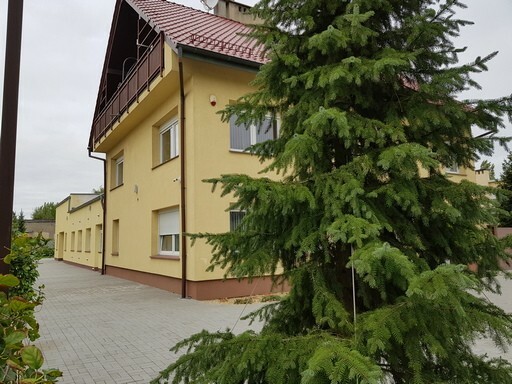 Our company is a member of the Polish Chamber of Commerce for High Technology and the European Association for Biometrics – Human Identity in Europe. We have collected very comprehensive know-how in many areas of ultrasonic technology. We provide a wide range of ultrasonic instruments and NDT inspection system solutions adapted to your needs. 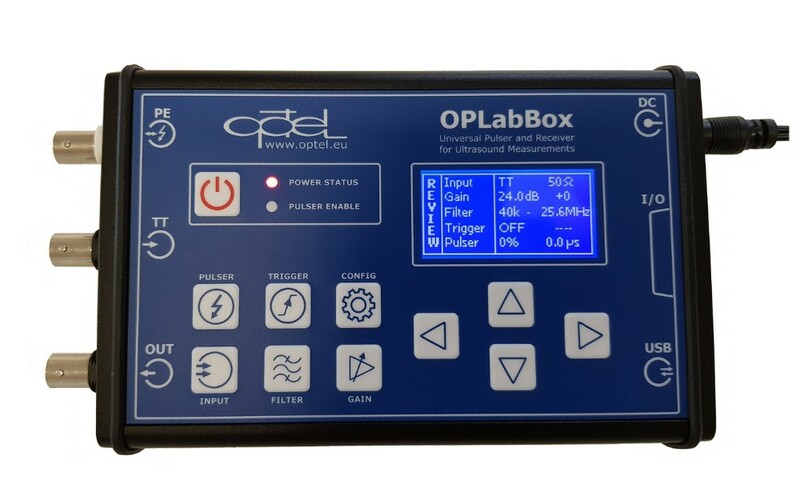 OPCARD, OPBOX flaw detector family with OPMUX multiplexer are a high performance, precise multi-channel ultrasonic testing instruments designed to deliver solutions for ultrasonic NDT inspection systems. Combined with software with specific imaging and analysis tools, they offer the best solution for all your ultrasonic inspection needs. A variety of configurations allows us to provide a wide range of instruments and inspection system solutions. 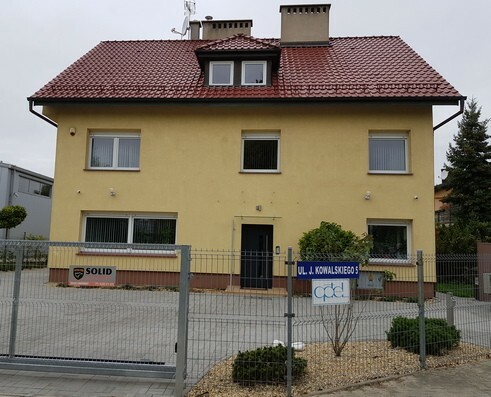 They are based on many years of experience, that we have collected since 1989. All our instruments are designed for use in the ultrasonic inspection system for automated or manual inspection in on-line or off-line solutions or as a stand-alone system for industrial or in laboratory applications. We design and develop for you online or offline ultrasonic inspection solutions specially adapted to your needs. All our systems are also suitable for upgrading old NDT devices with up to date technique. We can help you design your own ultrasonic system or update your system to the latest technology standards. You can extend the range of application based on our high-performing, cost-efficient ultrasonic instruments, proven in many applications around the world, reliable, user-friendly and flexible. You are welcome to use our ultrasonic know-how and integrate our ultrasonic instruments in your or your customer inspection system.